WormFax is a monthly summary of sheep WormTest results from around NSW, with data provided by parasitology labs at NSW DPI’s State Vet Diagnostic Lab (SVDL, Menangle) and Veterinary Health Research (Armidale). Given above average rain for the last 3+ months, it’s more important than ever to regularly monitor worm burdens using worm egg counts (WECs). And test drench efficacy when you treat: do a WEC on or just before the day of treatment, and again 14 days later. Money well-spent. Here is a simple exercise: Let’s say the Gross Margin for your sheep enterprise is $25 per dry sheep equivalent (DSE). Your feed is good (quality/quantity) but the sheep aren’t doing well. You haven’t done any egg counting because WEC on 10 samples costs (ball park figures) about $55 plus about $25 if you want a ‘worm type’ (larval culture/differentiation) done as well. Plus there have been few deaths and just a bit of scouring. ‘Can’t be worms. You start drenching more often anyway, just in case. The sheep do better but not a whole lot better. Your neighbour nags you into doing a DrenchTest. That means two WormTests, one on the day of drenching, and another 14 days later. Good grief! That’s about $160 bucks worth ((55+25) x 2). Your Scottish grandfather is rolling over in his grave, especially as you are using a premium drench – whatever that means. The test results come back. It seems the premium drench is about 40% effective against black scour worm and 75% against barber’s pole worm. Further down the track, you are using less drenches and your productivity has jumped and your GM is up to $33/DSE. You have 3000 DSEs, so that’s an increase of $24 000. For an investment of $160. These figures are wild guesses – and the scenario is an oversimplifcation – but the main point holds true: the return on investment (in WormTesting, DrenchChecks etc) is very, very good. To back this up a bit: back in the day (several years ago), when Gareth Kelly did his PhD, part of his study – done on real farms in the New England (haemonchosis-endemic area) region of NSW – was on comparing the cost of parasitism on farms with ‘typical’ worm control vs those with IPM (integrated parasite management), as detailed in WormBoss, for example. Ball park figures: the cost of parasitism on typical farms was ~$11/ewe vs $6/ewe on IPM farms. The IPM figures included recommended levels of wormtesting and drench resistance testing. So, a difference of roughly $5. Let’s apply this to say 3000 sheep: $15 ooo. “Parasitic helminths cause significant disease in animals and humans. In the absence of alternative treatments, anthelmintics remain the principal agents for their control. Resistance extends to the most important class of anthelmintics, the macrocyclic lactone endectocides (MLs), such as ivermectin, and presents serious problems for the livestock industries and threatens to severely limit current parasite control strategies in humans. Understanding drug resistance is important for optimizing and monitoring control, and reducing further selection for resistance. Multidrug resistance (MDR) ABC transporters have been implicated in ML resistance and contribute to resistance to a number of other anthelmintics. MDR transporters, such as P-glycoproteins, are essential for many cellular processes that require the transport of substrates across cell membranes. Being overexpressed in response to chemotherapy in tumour cells and to ML-based treatment in nematodes, they lead to therapy failure by decreasing drug concentration at the target. Several anthelmintics are inhibitors of these efflux pumps and appropriate combinations can result in higher treatment efficacy against parasites and reversal of resistance. However, this needs to be balanced against possible increased toxicity to the host, or the components of the combination selecting on the same genes involved in the resistance. Increased efficacy could result from modifying anthelmintic pharmacokinetics in the host or by blocking parasite transporters involved in resistance. Combination of anthelmintics can be beneficial for delaying selection for resistance. However, it should be based on knowledge of resistance mechanisms and not simply on mode of action classes, and is best started before resistance has been selected to any member of the combination. Increasing knowledge of the MDR transporters involved in anthelmintic resistance in helminths will play an important role in allowing for the identification of markers to monitor the spread of resistance and to evaluate new tools and management practices aimed at delaying its spread“. (ABC = ATP-binding cassette (ABC) transporters. None the wiser? Me either.). Lespine A and others, 2011. Review: P-glycoproteins and other multidrug resistance transporters in the pharmacology of anthelmintics: Prospects for reversing transport-dependent anthelmintic resistance. Int J Parasitol. My antecedents were Scottish: I can mock them as much as I like. It’s the Australian way. It’s a no brainer that we are in for a very wormy spring and summer in NSW, unless conditions suddenly turn hot and dry. Over the last 3 months, rainfall for NSW has been ‘above average’, ‘very much above average’ or ‘highest on record’ – depending on where you are in the state. Only sections of the coast have scored average rain, according to the Bureau of Met. It’s not too late to remedy these things. If you are weaning lambs in say late January, you can still improve the proposed paddock wormwise. (See WormBoss-Your Program). Under current conditions, and if you are in the eastern half of NSW, start doing WECs every 4 weeks. Next time you drench, do a WEC on the day of treatment and retest 14 days later. Big benefits for relatively small costs. Weaner cattle will be picking up lots of Ostertagia this spring in many areas. And Haemonchus as well, as a bonus, on the coast. Monitor WECs, but remember a low WEC in cattle may not always mean low worm burdens (sad but true), hence the need to monitor growth rates – and other potential signs of ‘worminess’ – as well. Like sheep and goat producers, many with cattle will be using less than highly effective drenches, due to resistance. Consider checking drench efficacy, the same as with sheep. If in doubt, use a cattle drench that is a combination of unrelated broad-spectrum actives. (There are only two of these currently on the market in Australia). In fact, using combination drenches are probably a good idea anyway. And then there is liver fluke. Temps are now generally mild to warm and there is plenty of moisture. This is seventh heaven for liver fluke and its intermediate host snails. The fastest fluke can complete one life-cycle is about 17 weeks, and they will just about achieve that under current conditions. Alas, there is resistance to flukicides too, so keep that in mind. If checking flukicide efficacy, the time to test is on the day of treatment and again 21 days later. This is the simplest approach. (Get good professional advice on this). The appropriate tests are either a fluke egg count or the new coproantigen (faecal fluke antigen) test. The fluke antibody ELISA test is about the most sensitive of current tests for liver fluke, but it is inappropriate in this case because the antibody can take weeks to go down after all fluke have been cleared out by an effective treatment. As always get good information and professional advice. Some good sources: wormboss.com.au; NSW DPI PrimeFacts; a veterinarian or other worm-savvy adviser. At the risk of sounding patronising, the evidence advanced for the superiority of using combinations of drenches (using unrelated actives concurrently) vs rotation of single actives – of resistance management – is not just based on computer models. Leathwick DM, Waghorn TS, Miller CM, Candy PM, Oliver A-MB. Managing anthelmintic resistance, 2012. Use of a combination anthelmintic and leaving some lambs untreated to slow the development of resistance to ivermectin. Veterinary Parasitology 187, 285-294, 2012. Click link above for abstract – and full text if you have access. Combinations are not a silver bullet; they are one part of an integrated approach to worm control. See WormBoss-Your Program. My sincerest congratulations, Joe, on having reached this milestone, and in such good shape ! You’ve been one of the outstanding examples to have stimulated my research career and I’m very honoured to have been able to meet you at the start thereof in 1968, and to have met up with you repeatedly over the years. Everything of the very best for the future ! The liver fluke we have in Australia, Fasciola hepatica, is ~ 30-50 mm long x 10 mm wide and leaf-shaped. Fasciola hepatica is the most common cause of liver fluke disease in temperate areas of the world, and the most important trematode of domestic ruminants. The other fluke in the Fasciola genus is Fasciola gigantica (75 mm x 12 mm). These three fluke (F.h., F.g, and Fascioloides magna) are in the family Fasciolidae. Their bodies are large and leaflike with suckers close together at the anterior end. The caeca have numerous diverticula (small side growths) and the ovary and testes are dendritic (branching, like a tree). All three are parasites of the liver and bile ducts of herbivorous animals and humans. (Georgi’s Parasitology, and Merck Vet Manual). Fasciola gigantica is economically important in Africa and Asia and is also found in Hawaii. Fascioloides magna has been reported in at least 21 states (USA) and in Europe. Fascioloides magna is up to 100 mm long, 2–4.5 mm thick, 11–26 mm wide, and oval. It is found in domestic and wild ruminants; deer are the reservoir host. The life cycle resembles that of Fasciola spp (Merck). A (former? :-) friend/colleague asked me if I did anything apart from WormMail. 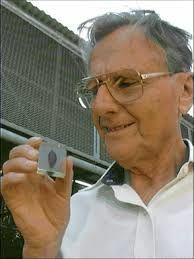 Dr Joseph C Boray is a highly regarded parasitologist and veterinarian who is particularly known worldwide for his work on – and knowledge of – Fasciola hepatica – liver fluke. I thought I would assemble some of his writing here, beginning with three essays he wrote for Turning the Worm, a NSW DPI newsletter that has been incorporated into WormMail. Emphases (bolding of text) in the articles below are mine. – Ed. Aspects of resistance in liver fluke are discussed, partly in light of work we carried out at the Elizabeth Macarthur Agricultural Institute (EMAI) of NSW DPI. Further tests showed that the combination products were effective against immature resistant flukes if the treatment was carried out with a combination product containing closantel and oxfendazole, through synergistic action (Rotafluke®, Closicomb®, Boray and Sluyter, 1997) (Neither now available in AU. See https://portal.apvma.gov.au/pubcris . – Ed.). The problem with triclabendazole resistance is more difficult because, when resistance develops, the drug does not kill flukes at any age from 2 weeks to 12 weeks old (Boray et al., 1997). Triclabendazole resistant flukes are widely distributed in the Goulburn Valley irrigation area in Victoria and a laboratory selected strain, originating from a property in the NSW central tablelands, showed total resistance to triclabendazole after challenge with the drug (Walker et al., 2004). As to the benzimidazole carbamates, trials conducted at EMAI showed some have some activity against liver fluke, but only against the adult stages. Of the BZs, luxabendazole (Hoechst) has the highest activity, but unfortunately commercial production of this drug had ceased. In our trials the drug was effective against immature flukes as well and its efficacy in combination with triclabendazole or other flukicides against immature flukes was high. Amongst the rest of the BZs, oxfendazole showed good efficacy against liver fluke aged 16 weeks or older. The combination products of triclabendazole and oxfendazole demonstrated good synergistic action and high efficacy against immature flukes (Flukazole C® for cattle and Flukazole S® for sheep). Further data on synergistic combinations can be found in Fairweather and Boray (1999). In our sheep trials (AT84), a reasonably good synergism was demonstrated against a triclabendazole resistant fluke strain. In Victoria a very serious resistance is slowly spreading south from Pyramid Hill, and the use of a synergistic combination offers good control. The combination of oxfendazole and closantel showed good synergistic effect with high efficacy against a closantel resistant fluke strains. Triclabendazole or the triclabendazole-oxfendazole combination can be given to young heifers, dry cows or pregnant cows up to 21 days before calving. Boray, J.C. and De Bono, D. (1989). Drug resistance in Fasciola hepatica. In Advances in Veterinary Science, eds: P.M. Outteridge, R.B.Rickards, pp166-169. Boray, J.C., Sluyter, V., Campbell, N.J. & McKinnon, A. (1997). Resistance of immature and adult Fasciola hepatica to triclabendazole in the field. Proceedings of the 16th International Conference of the World Association for the Advancement of Veterinary Parasitology, Sun City, South Africa.p.10. Fairweather and Boray (1999). Fasciolicides: Efficacy, Actions, Resistance and its Management, The Veterinary Journal, 158:81-112. One of the most debilitating parasitic diseases of sheep and cattle in Australia is liver fluke disease. Graziers spend about $10,000,000 per year on fluke drenches alone and production loss may cause another $50-80,000,000 annually depending on seasonal conditions. The production of wool is reduced in quality and quantity and lambing rate is lowered, the lambs have poor growth and replacement cost is increased. In cattle, fasciolosis causes reduced production and quality of milk, reduced growth rate and delayed conception rate in heifers (Boray, 1985, Dargie, 1986). About 250 million sheep and 300 million cattle are potentially affected by the disease worldwide. Control of fasciolosis is difficult and eradication is impossible in endemic areas without unsustainable expenses. The fluke survives in the host, in the snails and in the environment for long periods under good or unfavourable conditions. Apart from sensible farm management, only a strategic treatment programme, according to local climatic conditions, can keep the disease under sustainable control. In sheep the fluke will survive and produce eggs as long as the sheep lives, if not treated. The longest infection in sheep after a single infection was recorded as 11 years. Even a single fluke in sheep may produce up to 50,000 eggs per day, contaminating the pastures where the intermediate host snails are present. The fluke also survives for long periods in goats, domestic and feral pigs, kangaroos, wallabies, wombats and possums. Cattle and buffaloes have a natural resistance and a single infection will not survive longer than a year (Boray, 1969). Rabbits are susceptible to Fasciola hepatica and can maintain an infection for long periods but after a few passages the eggs of flukes are not viable. In the absence of other hosts the rabbit does not contribute to the contamination of pastures (Boray, 1969). Three species of snails are now endemic in Australia, the indigenous Australian snail, Lymnaea tomentosa (now Austropeplea tomentosa – Ed. ), which is dominant in Australia and New Zealand, and two introduced species, L columella and L viridis (Also now Austropeplea spp – Ed.). Unfortunately those introduced snails can thrive in permanent water sources at higher temperatures, while the Australian snail can only live in shallow creeks, springs and irrigation channels. The role of introduced snails in the epidemiology of fasciolosis has been discussed (Boray, 1978). The reproduction of snails is continuous throughout the year but peak numbers of young snails emerge from spring to the end of autumn. The reproduction rate of snails is very high and, theoretically, one surviving snail can produce one million snails in sixty days under favourable conditions. The snails become infected by the larvae of flukes, which hatch out from eggs (miracidia), and subsequent larval stages rapidly multiply within the snails. One single miracidium may produce 4,000 infective larvae (metacercariae). The snails may survive in drought under the mud for more than a year and the fluke larvae also survive in the snails for long periods, but stop developing and resume development after rain. In winter the snails survive in Australian climatic conditions in the endemic regions and the fluke larvae survive within the snails but stop development until the spring. At the increase of temperature the larvae rapidly develop into the infective stage, ready to be picked up by sheep and cattle. The animals can become infected as soon as October/November from the overwintering fluke larvae (Boray, 1969). The above situation was confirmed in the field by the present author and colleagues in the (Sydney) McMaster Laboratory, CSIRO in a three year experiment at an irrigation area using groups of uninfected sheep exposed to pastures every six weeks. After removal from the flukey pastures, egg counts were carried out and two months later the sheep were killed and the flukes counted in the livers. The experimental sheep became infected all around the year, including winter, but peak infections occurred between October and December from the overwintering fluke larvae in the snails and metacercariae on the herbage. The second peak normally occurs between March and June from infective larvae produced by snails during the summer period. This period is normally highly suitable for the multiplication of snails. Some of this infection was caused by the surviving metacercariae attached to grass at fairly low temperatures in May and June (Boray et al., 1969). Subsequent research carried out at the University of Melbourne in an irrigation area of Victoria confirmed the second peak infection found in NSW. This is due to intensive metacercaria production during summer and early autumn and also to the survival of metacercariae on grass in late autumn and early winter. This period is normally wet in Victoria, particularly in the irrigation areas. The overwintering infection was less important in Victoria, probably due to dry conditions in late summer and early autumn, preventing the infection of snails (Meek and Morris, 1981). Similar CSIRO trials in the Central Tablelands of NSW showed that peak infections were picked up between January and June with another peak from October until January, with much lower infection in winter. The trials in NSW demonstrated the importance of the dormant, surviving fluke larvae of the snail in winter emerging as infectious larvae in spring and summer (Boray et al., 1969). The results of the above mentioned trials were confirmed by the present author in laboratory studies carried out in controlled climate chambers in the Veterinary School of Hannover, Germany. It was shown that metacercariae survive low (- 10°C) and relatively high temperatures 25 to 30°C, provided that sufficient moisture (90 % or more relative humidity) was present. At low temperatures –1 to 2°C – the metacercariae survived longer with a high rate of viability, supported by tests in laboratory animals (Boray and Enigk, 1964). In the irrigation areas in Australia, moisture is present throughout the year, including winter, resulting in infections all year around from surviving metacercariae. In the Tablelands, particularly in the Central and Northern Tablelands of New South Wales, winter is normally dry and metacercariae will survive on the grass only in springs and the surrounding areas. However, the very important temporary snail habitats are too dry for the metacercariae to survive. The metacercariae will survive in winter in the South West of Victoria in the coastal areas and in some parts of Tasmania due to higher rainfall and the presence of moisture on the grass. Most infections will occur through cercariae produced in summer, but the metacercariae will not survive in the dry, hot weather. However, the metacercariae will survive in the higher rainfall coastal areas during the whole year. The laboratory studies mentioned above suggest that metacercariae can be present in most of the endemic regions of Australia throughout the whole year. The continuous production of metacercariae can be expected in summer under moist conditions and in many regions metacercariae will survive during early winter on moist grass (Boray and Enigk, 1964, Boray et al., 1969. Studies in the U.K. at the Central Veterinary Laboratory, Weybridge and in Australia at the McMaster Laboratory, CSIRO showed that the metacercariae live longer and are more viable in the winter months under moist conditions but no larval development occurs in the snails. Large numbers of metacercariae are produced from late spring until the end of autumn. Recent studies in Spain showed that the fluke eggs, the larval stages of fluke in the snails and the metacercariae survive during winter under the climatic condition in the Mediterranean areas of Spain. The climatic conditions in some districts of Australia are similar to those in Spain. Although hay may be rarely produced from snail habitats in Australia, the survival of metacercariae in hay could be of some importance. The problem has been investigated in many countries in Europe, where hay is harvested during summer and early autumn for winter feed, often from temporary snail habitats. Those studies concluded that if the hay was collected in rainy periods and kept at reasonably high relative humidity, the metacercariae can survive the winter for many months (Boray and Enigk, 1966). Feeding cattle with rice straw harvested in irrigated rice fields is a very important means of maintaining the life cycle of liver fluke in some countries in South East Asia, Japan and Nepal. In Japan the cattle are normally kept in stables and fed with rice hay. The rice fields are fertilised with the manure of the cattle. Contamination of hay with metacercariae may also occur in Indonesia and under Australian conditions. It can be concluded that under Australian conditions infection of stock may occur during any period of the year with some variation depending on seasonal / climatic conditions. Effective fluke control can only be achieved by preventive strategic methods. Since weather conditions are unpredictable, no accurate forecasting systems are available. Strategic control should be organised by treatments according to the average climatic conditions of many years, produced by the Meteorological Bureau for each district. Weather charts, based on average temperatures and rainfall, including the expected snail activity and recommended treatments were produced and can be obtained for any regions or countries (Boray, 1993, 1997). Correct farm management can reduce the exposure of sheep and cattle to infection by fencing in permanent snail habitats or by using a pasture rotation system (Boray, 1969). Completion of the life cycle of Fasciola hepatica and potential infection of sheep and cattle depends mainly on rainfall or the presence of moisture and temperature. The moisture necessary for the reproduction of snails and the hatching of fluke eggs is usually provided by small permanent creeks, which are normally fed by springs. Those creeks running through paddocks and gullies support the amphibious intermediate hosts L. tomentosa in shallow muddy habitats preferred by the snail. Similar conditions are created by seepage from canals in the irrigation areas. In drought some of the springs dry up but some moisture may be still present to maintain the growth of grass which has the infective stage of the fluke. The sheep and cattle congregate around those gullies and graze the contaminated herbage, resulting in heavy acute infection in the animals. The second important condition for the completion of life cycle and the survival of metacercariae is suitable temperature. In winter all stages of fluke development and reproduction of snails cease when the temperature is around 10°C or less, but the snails survive together with the dormant fluke larvae. The snails also survive in the mud during dry periods for about a year. During the winter the metacercariae may survive for some time on the herbage under moist conditions. The first invasion of herbage with the fluke cysts commences in late spring when the larval stages of fluke which are obtained from infection of snails in autumn complete their development (over-wintering infection). At the same time the snails rapidly multiply under the more suitable conditions and become infected by the fluke larvae (miracidia) which hatch out from the fluke eggs produced by the adult flukes in sheep and cattle. Within 2–3 months more fluke cysts will invade the herbage during the summer months (summer Infection) and reach high contamination by the end of summer and the beginning of autumn. Heavy infections may occur during this period but the clinical symptoms of acute and sub-acute fasciolosis are often unnoticed. The disease produces obvious symptoms in most cases when the parasites reach the chronic adult stage about 2 months later. Due to progressing anaemia the economic loss is more pronounced, reducing the wool growth and bodyweight in sheep, particularly in younger animals. The clinical symptoms of the acute disease will not be obvious for 2-3 months in the spring and early summer period unless the pastures are heavily contaminated and at that time increasing mortalities may occur. Chronic fasciolosis by adult flukes in the bile ducts may be present during the whole year if regular treatments are not carried out. The chronic disease is due to adult flukes, sucking blood in the bile ducts, resulting in chronic anaemia. In sheep the acute disease is due to mechanical damage when a large number of immature flukes migrate through the liver tissues and destroy functional liver cells. The inflicted damage to the liver tissues also retards growth of the flukes and the tissue migration period will be extended causing severe sub-acute fasciolosis. Peracute, acute and sub-acute fasciolosis is caused by the tissue migration of immature flukes. The pathological damage produces cell destruction causing extensive haemorrhage. Deaths are normally due to profound anaemia resulting from blood loss and the failure of liver function. However, the role of the excretion of proline and subsequent tissue changes should also be considered (Symons & Boray, 1968, Boray, 1985). Outbreaks may occur with considerable losses when seasonal and climatic conditions result in a large intake of metacercariae during a relatively short period. Much work on the pathology of fasciolosis was carried out in the McMaster Laboratory, CSIRO (Boray, 1967, 1969). Trials were carried out with experimentally infected sheep, which involved a total of 269 animals. It was shown that in sheep with an average fluke burden of 103, clinical disease was not evident until the fluke matured and a large proportion of the sheep was suffering clinical chronic progressive anaemia causing death in some of the sheep in the higher fluke recovery groups. In two groups of sheep, which had an average of 204 flukes after experimental infection, early liver damage causing reduced liver function was demonstrated with serological tests by detecting a very high level of the enzyme glutamate dehydrogenase as early as two weeks after infection. The high enzyme levels persisted for some weeks, demonstrating the presence of liver damage, caused by acute and sub-acute fasciolosis. All of those sheep died of progressive profound anaemia 26 to 36 weeks after the inoculations. In a group of sheep which had an average of 708 flukes in their liver after infection, the animals had acute and sub-acute clinical fasciolosis, resulting in haemorrhages and severe anaemia. All the sheep eventually died after 15 to 22 weeks infection. During decades of field work similar fluke numbers were often found in sheep. In one occurrence of acute and sub-acute fasciolosis in sheep an average of 1,384 flukes was present in the livers at necropsy. In one experiment a group of sheep was infected with 500 metacercariae each and was treated with triclabendazole at 10 mg/kg ten weeks later to achieve eradication of the fluke. Ten weeks after the treatment the same procedure was repeated to inflict heavy damage in the liver and then remove the fluke. In another group a similar procedure was carried out, but each sheep was infected with 100 metacercariae only. The sheep showed evidence of successful treatment and ten weeks after the second inoculation and treatment all the sheep were inoculated with 500 metacercariae each. One group of sheep remained uninfected and untreated as controls. A high level of liver damage was indicated by the increased GLDH level in serum. Similar numbers of flukes were present at necropsy 14 weeks after the challenge infection in all the sheep, including the controls. This experiment (in sheep) showed that a previous infection did not generate an immune reaction against the second infection and the serum enzyme test was a useful tool for diagnosing acute fasciolosis in sheep. In all the above experiments there was always sufficient liver damage by the flukes to explain deaths. However, in the majority of cases, secondary pathological lesions, such as peritonitis, pleuritis and traumatic damage in the lungs and pancreas, contributed to the condition. The primary damage due to the migrating flukes was detected with a single bromsulfalein clearance test as early as three weeks after infection (Symons and Boray, 1968), thus demonstrating the occurrence of liver function failure caused by immature flukes. In an endemic area a curative drench has to be given in April/May, when a high level of infection is anticipated. For this treatment a product should be used which is highly effective against both early immature and adult fluke. The best treatment for this period is an oral dose of triclabendazole (TCBZ) or its combination products, Fasinex 100®, Fasimec® Sheep, Flukare®, Flukamec® etc. A highly effective formulation of triclabendazole is available as FlukazoleS®, which has an improved efficacy by the addition of oxfendazole. The increased efficiency is achieved by a synergistic effect of the two ingredients and it is effective against flukes moderately resistant to triclabendazole. (For cattle in Australia, currently there is the additional option of injectable combination products containing the flukicides nitroxynil and clorsulon, these products also being highly effective against ‘all’ stages of fluke. – Ed). The second essential treatment (preventive treatment) is very important at the end of the winter or early spring (August/September) to eliminate the flukes surviving in the sheep. Infection may be obtained by ingesting metacercariae, which may have survived on the herbage if a wet period occurs during early winter. This treatment will reduce the contamination of the pasture before the active period for the snails and the fluke commences with increasing temperatures. At that time most of the flukes would have reached an advanced immature or adult stage when another product which is effective against those stages could be used with good results. Many products are available for that purpose, but another synergistic combination product (closantel+oxfendazole. – Ed) such as Closicomb® or Rota Fluke® (neither currently available – Ed) will be the most effective for this purpose, which is highly effective against flukes resistant to closantel on many properties. 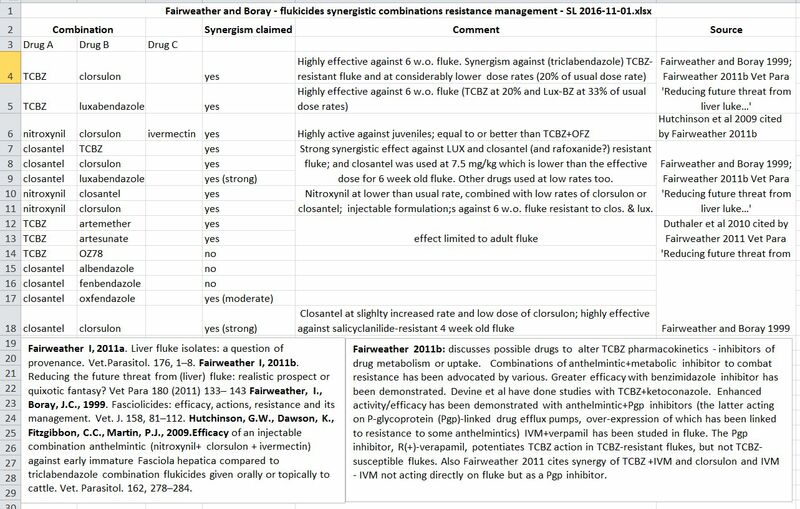 (I don’t know if there is direct evidence – apart from ‘biologically plausible’ arguments and extrapolations – indicating that rotation of flukicides significantly slows development of drug resistance by Fasciola. There appears to be little evidence for this for nematodes of sheep. (However, is it possible the use of adulticides in Spring allows the survival of sufficient numbers of unselected immature fluke, these providing a significant refugium?? On the other hand, animals, in colder areas at least, may be carrying relatively few immature fluke at the beginning of Spring if effectively treated at the beginning of winter? But, metacercariae do survive to some extent overwinter…. potentially adding to numbers on immature fluke inside host animals..?? Modelling required?). Notwithstanding this mention of rotation, Fairweather and Boray (1999) and Fairweather (2011) support the use of combinations (mixtures of/simultaneous use of) of different flukicides. Kelley and others (2016) say that the use of synergistic dual-active flukicide formulations may increase the lifespan of the respective actives. – Ed). It has been generally recognised that cattle are more resistant to fasciolosis than sheep (Boray, 1967, 1969, Ross, 1967). More intensive tissue reaction occurs in cattle than in sheep and in the bovine hosts a considerable age resistance is present. It has been concluded that the resistance observed in cattle is due to the combination of an early and a late tissue reaction forming a mechanical barrier against re-infection. The normally observed preferential migration of young flukes into the ventral lobe produces an effective mechanical resistance and the subsequent hypertrophy of the right lobe facilitates the survival of the host by leaving sufficient undamaged liver tissue. The dystrophic calcification of the bile ducts and the fibrosis proliferating into the parenchyma in chronic cases causes the elimination of the flukes. Calcification is not present in sheep. Relatively few results of experimental infections are available. Some results of experimental infections carried out in McMaster Laboratory (Boray, 1969) may give reasonable information on the clinical pathology expected to occur in the field. Severe anaemia was diagnosed in a group of calves aged 6 to 8 months after experimental infections with 1,000 metacercariae each. One calf died but three calves recovered spontaneously. A group of calves, aged 4 months, which had a mean number of 1,358 flukes in the liver, showed profound anaemia and high egg counts when the flukes reached maturity. In another group of 6 calves aged 6 to 8 months one calf died, two showed severe anaemia and two of the calves showed no clinical symptoms. They had a mean number of 1,381 flukes in the liver. When a group of calves aged 17 months was infected with the same number of metacercariae only a mean number of 620 flukes were recovered from the liver and the calves survived. In another experiment cattle aged 6 to 8 months or 2 years were infected with 10,000 metacercariae. All the younger animals showed profound anaemia and all died of sub-acute or chronic fasciolosis. A mean number of 4,671 flukes were recovered at necropsy. The two year old cattle survived and a mean of 512 flukes was recovered from the livers. It was also shown that calves in good condition showed more resistance than poorer ones. Some breeds of cattle were more or less resilient to fluke. In a comparative experiment, Jersey calves aged 4 months showed more serious clinical symptoms compared to Herefords of the same age after experimental infections resulting in a similar number of flukes recovered at necropsy. It can be concluded that acute and sub-acute fasciolosis occurs mainly in younger animals with severe anaemia and death occurring on heavily contaminated pastures. It would happen more often when susceptible sheep are grazed together with calves, because sheep normally produce more eggs than cattle to contaminate the pastures. However, there is considerable evidence that even a low infection in young cattle may result in reduced growth rate, reduced pregnancy rate and delayed conception of heifers. In adult cows milk production is reduced due to sub-clinical infections with F. hepatica (Dargie, 1986). Strategic liver fluke control is essential to maintain productivity of cattle even if no visual signs of clinical fasciolosis are present but positive egg counts, serological tests or ELISA tests using milk samples will confirm the presence of flukes. In dairies, triclabendazole preparations can be used in young heifers and in dry cows. Those products can be used in pregnant cows up to 21 days before calving. In lactating cows an ivermectin/clorsulon product can be used if it has clearance for that purpose. (Again, check product labels and PUBCRIS in for the latest inofrmation. For sheep and goat products, also see WormBoss.com au – Drenches- Ed). The second important treatment (preventive treatment) is recommended to be carried out in August/September to eliminate the flukes surviving in the cattle after the Summer/Autumn period. This time most of the fluke have reached adult stage, and combination treatments such as Virbamec Plus®, Ivomec Plus® or other products effective against adult flukes can be used. Another triclabendazole treatment and particularly a PourOn application of the drug should be avoided. From pour-on formulations delayed absorption occurs and may contribute to the development of drug resistance. The use of an alternative drug would achieve chemical rotation and reduce the chances for the development of resistance to triclabendazole. In endemic properties with a history of heavy infections, a third treatment may be necessary in January/February. It is particularly important when spring and early summer rain would stimulate the reproduction of snails or dry periods when the animals congregate in moist pastures. This treatment is highly recommended for young cattle, which are more susceptible to infection and likely to develop clinical fasciolosis. During this period a high contamination of the herbage is expected through the maturation of “overwintering” larval stages of the parasite, when the temperature increases. An increased number of cercariae will also complete their development in the snails, which were infected in early summer. This treatment in January/February should be carried out with an oral drench preparation of triclabendazole, which is highly effective against immature flukes. Higher efficacy can be achieved if a triclabendazole/oxfendazole product (FlukazoleC®) is used with synergistic action, even against flukes moderately resistant to triclabendazole. Dairy heifers can be treated with triclabendazole products until 21 days before their first calving. Triclabendazole resistance in sheep and cattle is present in the Goulburn Valley irrigation area around Echuca, Pyramid Hill and Shepparton. In those areas an alternative product should be used such as an injectable application of the combination products containing ivermectin and clorsulon, which is suitable for both dry and lactating cows in dairies. It is important that in mixed grazing properties sheep and cattle should be treated at approximately the same time. Recently two pour-on products were released to the market and the potential problems of the treatment with those products will be discussed below. Triclabendazole showed high efficacy against both early immature and adult Fasciola hepatica in sheep (Boray et al., 1983) and in cattle (Boray, 1982). The drug is a benzimidazole derivative, but the presence of chloride atoms and a thiomethyl group and the absence of a carbamate moiety clearly distinguishes it from all other benzimidazole compounds. Its spectrum of activity is unusual. Triclabendazole is very specific for F. hepatica, F. gigantica and Fascioloides magna. It lacks activity against nematodes and cestodes and other trematodes as well. Triclabendazole is metabolised by the liver into two active forms, triclabendazole sulphoxide and triclabendazole sulphone. Both of the metabolites are active against Fasciola sp. It is clear that the rate at which these metabolites are produced and in what concentration will determine their efficacy against liver fluke. To achieve high efficacy against early immature liver fluke a high concentration of those metabolites are required to act against immature fluke, which are migrating in liver tissues. The adult flukes in the bile ducts are killed by those metabolites as they are excreted into the bile. The mode of action of triclabendazole was reviewed by Fairweather & Boray (1999). Triclabendazole has a multiple action against the flukes. It seems to affect the energy-producing pathways resulting in a decrease of motility. Triclabendazole also damages the reproductive system of F. hepatica reducing egg production and growth of the fluke. The most significant effect of the drug is the inhibition of protein synthesis, which in turn, produces morphological damage to the integument of flukes. Most of the experimental data conforms to a microtubule-disrupting action and disruption of protein synthesis. Additional studies showed that triclabendazole is also capable of uncoupling oxidative phosphorylation and this action was greater by the sulphoxide and sulphone metabolites than that of the parent compound. (Kelley and others (2016) also discuss the mode(s) of action of TCBZ, including inhibition of adenylate cyclase. – Ed). During the development of triclabendazole in the second half of the 1970s, the sheep and cattle experiments were carried out in the CIBA-GEIGY Research Centre in Australia, supervised by the present author, who was then the Director of Research and Development in the company. It was shown that at comparative dose rates the oral formulations were superior to the injectable or pour-on formulations. The pour-on formulation produced by CIBA-GEIGY in Basel used an excellent solvent, resulting in very good absorption from the surface of the skin. However, even at drastically increased dose rates of up to 30 mg/kg, high efficacy was only achieved against adult flukes. Experience from trials with other pour-on products, which were carried out at the Elizabeth Macarthur Agricultural Institute, NSW Agriculture in the late 1980s has shown that the age and breed of cattle and the season when the treatments were carried out greatly influenced the efficacy of a pour-on formulation. The absorption of the drug may be impaired by the dense hair growth during winter, particularly on beef cattle. When the choice of drug for the treatment of cattle is triclabendazole, it can be concluded that the best results will be achieved by using the products or combination products of triclabendazole, which are formulated for oral application. Boray, J.C., (1967). Studies on experimental Fasciola hepatica infections, with particular reference to acute fascioliasis in sheep. Annals of Tropical Medicine and Parasitology, 61: 439-450. Boray, J.C. (1967). The effect of host reaction to experimental infections in sheep and cattle. In Veterinary Medical Review ed.E.J.L.Soulsby , N.G.Elvert, Marburg, pp 84-96, 1967. Boray, J.C. (1969). Experimental Fascioliasis in Australia. In Advances in Parasitology, Ed. B.Dawes,. Academic Press, London and New York,1969, Vol.7, pp.95-210 Boray, J. C. (1982) “Chemotherapy of Fasciolosis”, New South Wales Veterinary Proceedings, 18: 42- 47. Boray, J.C., Crowfoot, P.D., Strong, M.B., Allison, J.R., Schellenbaum, M.von Orelli, M. and Sarasin, G. (1983). Treatment of Immature and Mature Fasciola hepatica Infections in Sheep with Triclabendazole. Vet.Rec. 113, 315-317. Dargie, J.D. (1986). The Impact on Production and Mechanisms of Pathogenesis of Trematode Infections in Cattle and Sheep. In ed. M.J Howell, Parasitology-Quo vadit. Proceedings of the sixth International Congress of Parasitology, Pp.453-463, Australian Academy of Science, Canberra. Fairweather, I & Boray, J.C. (1999). 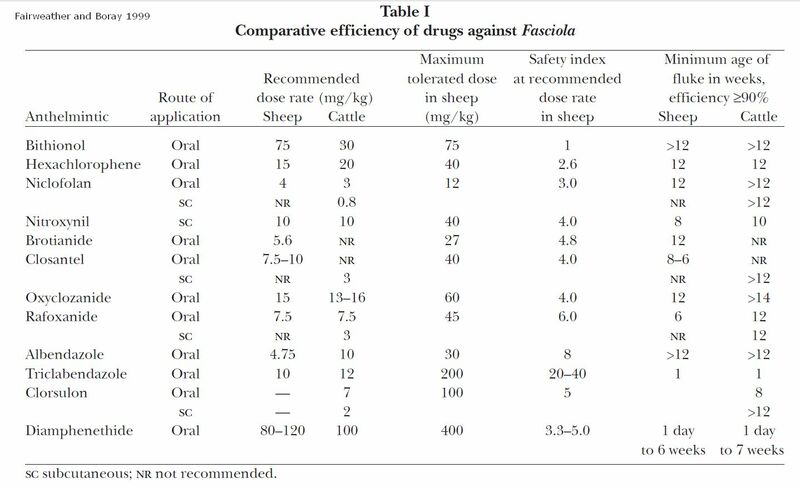 Fasciolicides: Efficacy. Actions,Resistance and its Management , The Veterinary Journal,158:81-112. Meek, A.H. and Morris, R.S. (1981). A computer simulation of ovine fascioliasis, Agricultural Systems, 7: 49-77. Ross, J.G. (1967). The comparison of the Resistance Status of Hosts to Infection with Fasciola hepatica. In Veterinary Medical Review ed.E.J.L.Soulsby , N.G.Elvert, Marburg, pp 96-105, 1967. Symons, L.E.A. and Boray, J.C. (1968). The anaemia of acute and chronic ovine fascioliasis. Z.Tropenmed.Parasit. 19, (4), 451?472. (One response to this article (above) by Dr Boray (on oral vs topical) was that he had not kept abreast of developments in formulation chemistry. Given that no evidence was produced to indicate this was a valid rebuttal, I cannot comment, except to note that a study reported by Sargent (of Intervet-Schering Plough-Coopers) and others in 2009 on ‘Seasonal differences in the efficacy of pour-on formulations of triclabendazole and ivermectin or abamectin against late immature liver fluke (Fasciola hepatica) in cattle’ showed “Efficacies for winter, spring and summer respectively, based on arithmetic mean total fluke counts, were 78.9%, 91.7% and 99.6% for Coopers Sovereign and 73.4%, 89.7% and 99.6% for Genesis Ultra” (The differences in efficacy for the two products were not significant). The study was done to “examine the efficacy of Genesis Ultra” (TCBZ+abamectin) “ and Coopers Sovereign” (TCBZ + ivermectin) ” against late immature (6 weeks old) liver fluke of cattle when applied under different seasonal conditions” possibly and in part because of previous findings such as this: “Seasonal differences in the efficacy of a pour-on anthelmintic formulation containing levamisole have been previously reported in Australia (Forsyth et al., 1983) although a later study conducted in the United States of America failed to repeat the findings (Seibert et al., 1986).” The authors refer to a paper by Richards (of Ciba-Geigy) and others (1990): “Previous reporting of multiple total fluke count studies where triclabendazole was administered orally to cattle against 6-week-old immature liver fluke at the recommended dose rate of 12 mg/kg resulted in reported efficacies (based on arithmetic means) of 80.6%, 85.4%, 92.6% and 97.8% (Richards et al., 1990). No explanation of this variation was provided nor were seasonal details at the time of treatment. However, it can be assumed that topical treatments such as those used in the current studies will be more susceptible to seasonal effects due to the need for the actives to move transdermally into the systemic system of the animal”. “Seasonal differences with treatment efficacy were indicated. The studies also confirmed previous observations that liver fluke egg counts overestimate the efficacy of fasciolicides and that total fluke counts is the most reliable method for assessing efficacy of such products”. – Ed.). (Further note:  Triclabendazole products in dairy animals and possible residue issues: Check the label for the particular triclabendazole product you wish to use, particularly with respect to withholding periods and whether they are registered for use in dairy cattle. Of course, the label should be read and followed for any product that you use. Some pour on triclabendazole (TCBZ) products have met APVMA.gov.au requirements to allow label claims of being effective against all three stages of liver fluke (adult, immature, early immature). In the case of liver fluke, APVMA allows a claim of ‘effective’ if the product has an efficacy > 90% efficacy (c.f. > 95% for nematodes). Notwithstanding this, Hutchinson (NSW DPI) and others (2009 ) showed that, with respect to very young (2 week old) fluke, an oral formulation of triclabendazole, although not particularly effective, was more effective than a pour-on formulation. Martin (of Virbac) and others (2010) reported an oral formulation of triclabendazole (TCBZ + OFZ) had greater efficacy than a pour-on formulation (TCBZ +ABM) against 28 day-old fluke. But check the papers for the details. They said “Although some anthelmintics, namely levamisole and various macrocyclic lactones, have been successfully delivered by topical (pour-on) application, TCBZ has been thought unsuitable for such application because of its need for rapid absorption from the gastrointestinal tract and first-pass hepatic metabolism”. Nitromec injection. Nitromec(R) Injection, which was launched in early 2009, is not registered for use in dairy cattle (cattle which are producing or may in the future produce milk which may be used in products for human consumption). Again, it is important to read and follow the label. Richards RJ, Bowen FL, Essenwein F, Steiger RF, Büscher G, 1990. The efficacy of triclabendazole and other anthelmintics against Fasciola hepatica in controlled studies in cattle. Vet Rec. 1990 Mar 3;126(9):213-6. Abstract: In eight controlled tests 274 cattle were used to assess the efficacies of triclabendazole, albendazole, clorsulon, nitroxynil, oxyclozanide and rafoxanide against Fasciola hepatica. Against one-, two- and four-week-old early immature fluke the mean efficacies of triclabendazole given orally at 12 mg/kg were 88.1, 95.3 and 90.7 per cent, respectively. Clorsulon, nitroxynil and rafoxanide administered at recommended dose rates showed negligible activity against these stages of the parasite. Against six- and eight-week-old infections the mean efficacies of triclabendazole at 12 mg/kg were 87.5 per cent and 95.7 per cent, respectively. Against F hepatica aged six weeks, albendazole and oxyclozanide showed no activity and clorsulon, nitroxynil and rafoxanide had only slight to moderate activity. The efficacies of triclabendazole, clorsulon, nitroxynil and rafoxanide against 10- or 12-week-old parasites were 100, 99.0, 99.1 and 90.1 per cent, respectively. Albendazole and oxyclozanide showed poor efficacy against 12-week-old infections. Sources: Richards and others, 1990; Sargent and others, 2009; Martin PJ and others, 2009; Hutchinson and others, 2009. Compiled by SL, Oct 2016 (E&OE). Click on table above (JPEG) or link below to PDF. See Table 1, below, from Fairweather and Boray, 1999. There have been some newcomers since 1999. For example, in Australia, two products for cattle (Nitromec, Nitrofluke) which contain two flukicides, nitroxynil and clorsulon, (+/-ivermectin). (Click on table to enlarge JPEG or click on link for PDF). Joe’s current Primefact on liver fluke at the DPI website. Primefact Number: 446 Edition: First edition Released/reviewed: 01 Mar 2007 This replaced AGFACT A0.9.57 which is also attached. Drs Joan Lloyd, Joe Boray and Noel Campbell wrote the current NSW DPI PrimeFact on the intermediate host snails of Fasciola hepatica. This was based on the original article written by Noel Campbell (who, by the way, was the Victorian representative on the national technical team that developed WormBoss Mk I (launched in 2005; succeeded by WormBoss Mk II, launched 21.11.12). Triclabendazole (TCBZ) remains the most effective flukicide for the treatment of fasciolosis in ruminants because of its high activity against the most clinically damaging immature, migratory stage of infection. However, the over-dependence on TCBZ has led to the almost inevitable development of drug-resistant fluke populations. Since the first report of TCBZ resistance (in Australia, by Overend and Bowen, 1995), further well-documented reports have identified resistance in Australia (Walker et al., 2004 and Brockwell et al., 2014), in South America (Olaechea et al., 2011 and Ortiz et al., 2013) and in a number of European countries, including The Netherlands, UK and Ireland (e.g. Coles et al., 2000, Gaasenbeek et al., 2001, Flanagan, 2010, Mooney et al., 2009, Gordon et al., 2012 and Hanna et al., 2015). Taken on its own, the existence of TCBZ resistance in diverse areas of the World is a matter of considerable concern and represents a challenge to management strategies in the future. Other drugs are available commercially, but their activity is confined to the adult stage and so they do not share the same range or spectrum of activity as TCBZ. Moreover, the position of TCBZ as market leader is being compromised by farmers responding to anecdotal reports of resistance by switching to alternative (and less effective or potentially inappropriate) drugs, even when this may not be warranted. However, there is another area of concern, namely, the recent and likely continued future increase in the incidence and spread of the disease (discussed by Fairweather, 2011b). These two issues (of resistance and altered epidemiology) should serve as drivers in the search for new drugs. One group of potential new compounds is the artemisinins. Artemisinins: Artemether and artesunate are artemisinin derivatives. ‘The artemisinins are important antimalarial agents and anti-schistosomal compounds (e.g. Woodrow et al., 2005, Utzinger et al., 2007, Cui and Su, 2009, Ding et al., 2011 and Keiser and Utzinger, 2012). ‘More recently, they have received a considerable amount of attention as potential fasciolicides’. – O’Neill et al 2015. Elliott TP, Kelley JM, Rawlin G and Spithill TW, 2015. High prevalence of fasciolosis and evaluation of drug efficacy against Fasciola hepatica in dairy cattle in the Maffra and Bairnsdale districts of Gippsland, Victoria, Australia. Veterinary Parasitology 2015 Apr 15;209(1-2):117-24. Fairweather I, 2011a. Liver fluke isolates: a question of provenance. Vet.Parasitol. 176, 1–8. Fairweather I, Boray, JC, 1999. Fasciolicides: efficacy, actions, resistance and its management. Vet. J. 158, 81–112. Kelley JM and others, 2016. Review: Current threat of triclabendazole resistance in Fasciola hepatica. Trends In Veterinary Parasitology (Covers various topics, including reports (peer-reviewed) of resistance worldwide to various flukicides. -Ed). Or, less recent, the epic review by Fairweather and Boray, 2009, of course: Fairweather I, Boray JC, 1999. Fasciolicides: efficacy, actions, resistance and its management. Vet. J. 158, 81–112. O’Neill and others, 2015. A comparative study on the impact of two artemisinin derivatives, artemether and artesunate, on the female reproductive system of Fasciola hepatica. Vet Parasitol. 2015 Jul 30;211(3-4):182-94. Yvette Brockwell and others. Various papers recently on triclabendazole resistance on cattle farms (SE Australia) and use of the copro-antigen test). The copro-antigen test is available in NSW from the NSW DPI (soon!) and CSU Wagga Wagga vet labs.